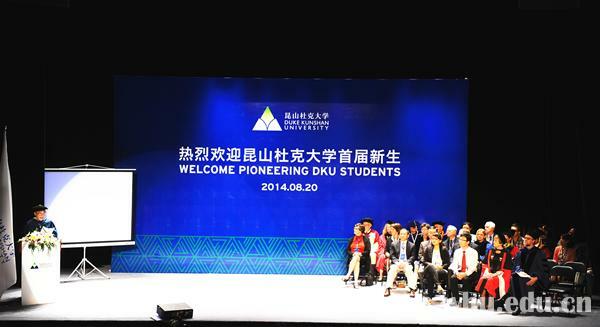 On August 20th, Duke Kunshan University held its first opening ceremony. Chancellor Liu Jingnan, Executive Vice Chancellor Mary Brown Bullock as well teachers and students at home and abroad were present at the ceremony. In his speech, Liu Jingnan accentuated the pursuit of truth, moral standards and the concept of making contributions to our society by knowledge. He introduced that Duke Kunshan University, with brand new mode, is established by the joint effort of Duke University and Wuhan University. It brings in the advanced educational theories, management modes, teaching methods and curriculum systems of Duke University and aims to become a elite, research intensive, comprehensive and international university. Mary Brown Bullock pointed out that the ceremony made a good demonstration of how to forge a tradition and culture for an internationalized group by cooperating with teachers and students. We expect to make a new example for global higher education in the future. As one of the universities with the longest history in China, WHU’s profound historical background will help Duke Kunshan University develop rapidly with the most advanced educational theory of China. We learn the core values from WHU and uphold the integrated values required by a world-class university—Improve Yourself, Promote Perseverance, Seek Truth and Make Innovations. William Johnson, a professor of classical literature of Duke University, delivered a lecture on behalf of teachers. He stated that Duke Kunshan University has the potential of sharing prospective and promoting mutual understanding, thus enhancing the global vision for Duke University and its staff. Ye Yongling from WHU’S School of Public Health explained the importance of keeping an open mind and he expected to have a better understanding of the concept “World Citizen” through the undergraduate semester program of Duke Kunshan University. "Let’s support each other, help each other, create the best studying experience hand in hand and work assiduously to grow and develop in Duke Kunshan University." proposed by Ginny Delacruz, an American student. The opening ceremony was a mixture of both Chinese and American culture. It includes the solemn entrance ceremony and ttraditional Kunqu Opera performance. At the ceremony, all the freshmen signed the community rules of Duke Kunshan University publicly and promised to comply with the rules of “honesty, justice, respect and responsibility”. Before the ceremony, all the students and staff mourned over the victims to Kunshan explosion accident on August 2nd and Yunnan Ludian earthquake on August 3rd. The orientation week embraces diversified activities for students such as the introduction to campus policy, library resource, academic morality and cross-cultural communication, etc. and social activities such as the ice cream sodality, movie night, barbecue that help students and teachers adapt to the new life in Duke Kunshan University. Duke Kunshan University got the formal approval of Chinese Ministry of Education in September, 2013 and adopted the chancellor-in-charge system under the guidance of Board of Trustees. Currently Duke Kunshan University sets up three master programs awarding Duke University’s degrees which are Medical Physics, Global Health and Management. Furthermore, the university offers second-campus international studying program that grants credits of Duke University for undergraduates all over the world.